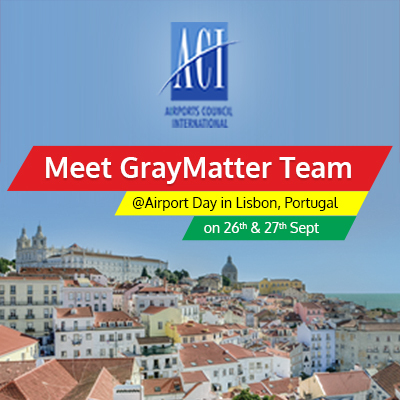 GrayMatter was participated in Airports Day Event in collaboration with SAP. The event was held in Lisbon, Portugal on September 26-27 2017. The purpose of the event is to share knowledge and best practices on digitization at airports. 100+ Senior Airport executives are attended for this forum to discuss the evolving Business-IT strategy, in the light of digitization at airports. GrayMatter executives shared information about the Airport Analytics (AA+) solution and its tremendous significance with the increasing demand for data driven business insights. Mr. Vikas Gupta (CEO, GrayMatter and ACI Asia-Pacific Regional Board Director (WBP) was one of the distinguished speakers for the event and will be delivering his presentation on 27th of September, 2017.